Posted April 2, 2019 by Bergen Mobile Concrete & filed under Concrete Maintenance. 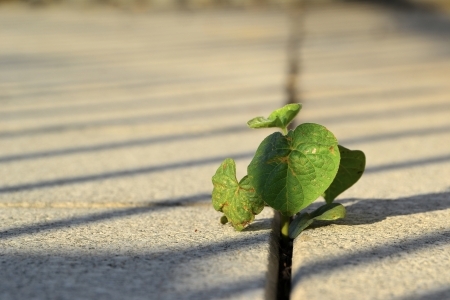 Are unsightly weeds taking a toll on the appearance of your concrete paver patio? These weeds might be awfully stubborn, but there are steps you can take to prevent unwanted growth from sprouting in the joints of your paver patio. This way, your patio will always look as good as the day it was first built. Begin by killing any existing weeds. The first thing you’ll want to do is kill any existing weeds that are already growing in your patio. There are many products you can buy to do this, but the safest way to kill weeds is with a solution of white vinegar, water and a few drops of dish soap. Just apply this solution to the weeds with a spray bottle and they should begin to die in a matter of hours. Once the weeds have died, you should remove them by hand to prevent them from growing back. If possible, use a short-handled weeding tool to pull the weeds up by their roots; simply breaking weeds off at the base of the stem may not be enough to keep them from returning in the future. Fill the joints between concrete pavers with polymeric sand. Now that you’ve removed the existing weeds from your patio, it’s time to fill the joints between the concrete pavers so that weeds can’t come back. Specifically, you should use polymeric sand that contains a special bonding agent that forms a tight seal when wet. Use a broom to work the sand into the joints, wet it with a misting attachment on a garden hose and then allow it to dry for a few days to create a tight, weed-proof seal. Need a hand with your next concrete paving project? Our concrete buggies and metered mobile mixers make it easy and affordable to pour patios, driveways and more. Just give us a call at (201) 979-7550 today to get started!